Plumbing repairs have often been overwhelming to homeowners and the fear of creating a bigger problem if done incorrectly is always a worry. Now, with the invention of push-fit plumbing connections, fixing that leaking pipe or putting in a new faucet is both simple and affordable! I am a novice when it comes to plumbing repairs, so when my pipe burst this past winter due to the extreme cold temperatures, I was figuring that I would have to call in a plumber and face an expense of at least $150. After I was introduced to push-fit pipe fittings, I soon realized that I could perform this repair myself and save a lot of money. The whole job was simple and cost only about $30 to complete. How are they installed? 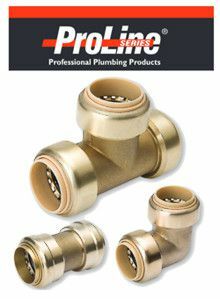 Mueller’s ProLine push-fit fittings work as you might expect; they snap onto a smooth edge of cut copper to create a permanent and instant connection. Just push until they snap in place and you are all set! Can they be removed? Yes, push-fit fitting can be removed with ease. There is a handy little c-shaped tool that is slid around the pipe and pushed down onto the fitting to release its grip. The two pieces are separated with no residue or damage done to the pipe, allowing both parts to be re-used right away. How long do they last? Push-fit fittings are considered permanent and will last a lifetime. In fact, they are the only method that is approved by the plumbing code for connections behind walls with no access. What fittings are available as push-fit? Most every fitting is available as a push-fit, including ball valves, couplings, tee joints, elbows, threaded adapters, and caps. Thanks for reading everyone, and happy home repairs to you!